Jack Ma's Alibaba Group is one of the Chinese tech giants building a new future for global e-commerce. China leads the world in e-commerce. 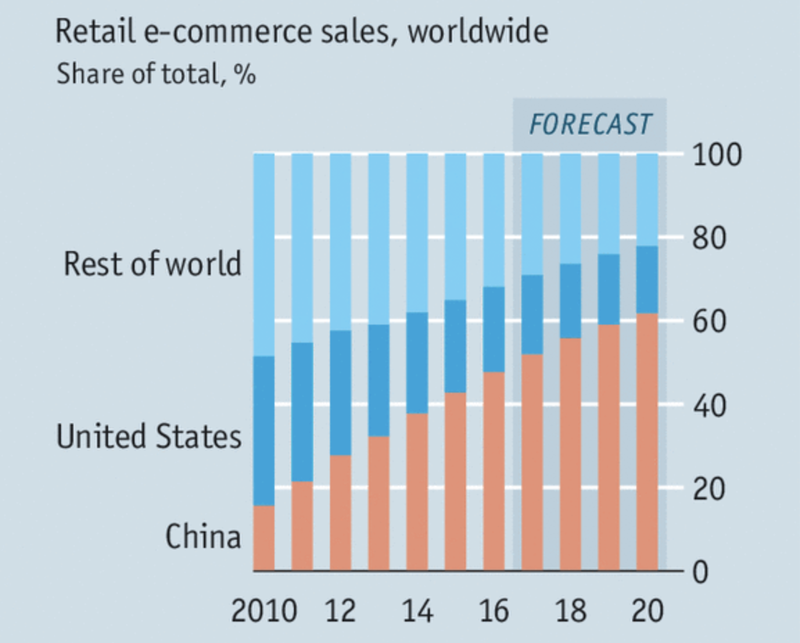 More than 40% of the world's e-commerce transactions currently take place in China, up from only 1% about a decade ago. Local Chinese tech champions such as Alibaba Group, Tencent and JD dominate a rapidly growing e-commerce ecosystem, mostly within China. Chinese consumers are mobile savvy, so much so that even older generations are comfortable with mobile commerce and purchasing online to offline (O2O) services. The rapid development of this industry combined with a large and growing digital consumer base has fuelled tremendous growth both domestically and abroad via cross-border trade. This unique environment is propelling innovations in commerce and digital trade, with China serving as a testbed for new ideas that will propel the future of the global e-commerce marketplace. Here are five future trends to look out for in China's e-commerce landscape. At the 2018 World Economic Forum Annual Meeting in Davos, Jack Ma, the founder and executive chairman of Alibaba Group, argued: "No-one can stop globalization, no-one can stop trade." One of the greatest indications of the role e-commerce plays in driving globalization is the amount of cross-border e-commerce between China and the rest of the world. In 2016 the market size of cross-border retail e-commerce sales in China was $78.5 billion; this figure is expected to exceed $140 billion by 2021. What is driving this trend? First, as a record number of Chinese go abroad to work, study and travel they are gaining exposure to more international brands and products than ever before. When they return home to China, these shoppers rely on cross-border e-commerce to purchase international products that are either not available domestically or are too expensive in local flagship retail outlets within China. Second, due to concerns around consumer and food safety, Chinese consumers are turning to cross-border e-commerce as a way to access trusted international brands. This is particularly the case for key product categories such as baby products, health and nutrition, beauty and organic food products. Consumers can either use Chinese cross-border e-commerce platforms like Alibaba's TMall Global or JD's JD Worldwide, or they can rely on unofficial overseas sellers, also known as daigou. 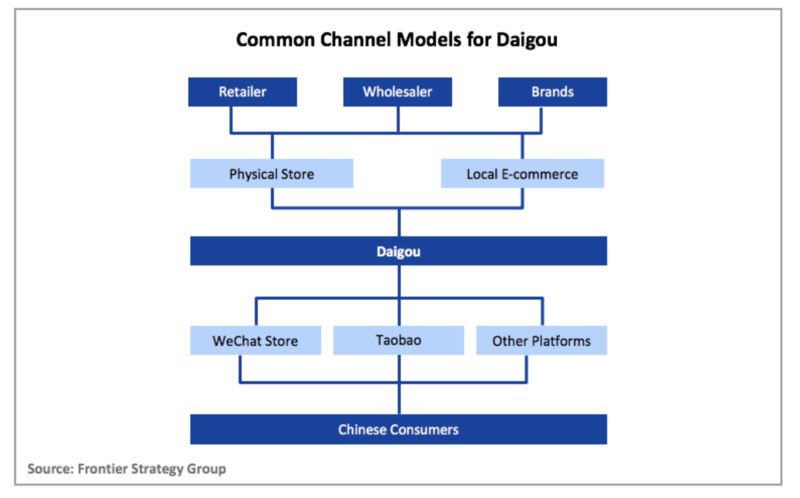 Daigou agents reside in foreign markets, purchase authentic merchandise overseas and then use local platforms like WeChat and Taobao to reach Chinese consumers. As China's existing import/export structure was created before the advent of mass cross-border e-commerce transactions, the country has been setting up new cross-border e-commerce pilot zones in 13 cities since 2015, which has led to tremendous growth, and has just approved 22 more locations across China. These pilot zones provide a streamlined system with simplified regulations for faster examination and approval, custom clearance, and easier information sharing for cross-border e-commerce imports and exports. In addition, Chinese e-commerce companies such as Alibaba have also been promoting special e-commerce trade zones in countries like Malaysia and Thailand; although there have also been some concerns on monopoly and impact on local firms. When it comes to cross-border e-commerce, and even domestic e-commerce, Chinese consumers are turning to key opinion leaders - also known as digital influencers - to learn about the latest products and trends. Digital influencers produce content ranging from articles on their official WeChat (China's version of Facebook) accounts to social media livestreams. Influencers’ livestreams especially are boosting e-commerce market growth; according to a recent Deloitte report, livestreaming in China will lead to $4.4 billion in direct revenue this year, with influencers’ livestreams set to reach as many as 456 million viewers. Chinese digital influencers play an important role in shaping consumer preferences and driving awareness of new products among their followers. For brand collaborators, influencers possess an uncanny ability to drive product sales in the Chinese market, with numerous documented examples of brand-influencer partnerships leading to hundreds of thousands of dollars in sales - in a matter of hours or even minutes. While consumers in the west react to Amazon's acquisition of Whole Foods Market and speculate how the combined firms will produce a new generation of digitally-connected retail, that future has already arrived in China. Alibaba and JD are rapidly opening retail outlets across the country, called Hema and 7Fresh respectively. Both brands offer a wide range of digitally-connected experiential shopping. For example, customers can use their phone to scan the barcode of any item in the store to learn about the product’s source, nutritional information and price. Delivery is available at both stores in as little as 30 minutes after consumers have made their purchases. In addition to providing unique and convenient shopping experiences, these new store concepts and their ability to provide reassurance to customers of the freshness and quality of the purchases help to ease many of the same concerns that have led shoppers to turn to cross-border e-commerce in the first place. Lastly, the future of e-commerce in China will increasingly occur in rural, inland regions where there is still tremendous room for growth. These rural consumers skipped the PC-era and use their mobile phones to access the internet and make purchases online. JD has announced plans to build 185 drone airports in Southwest China to use for deliveries. Alibaba, meanwhile, is in the process of scaling its "Rural Taobao" platform, including a recent $716 million investment in Huitongda, an eight-year-old rural-focused platform with 80,000 member stores in 18 provincial locations. As Alibaba and JD seek to reach this next wave of e-commerce customers, they are developing the necessary infrastructure as part of complex logistical networks, which is very much aligned with the Chinese government's goals to develop the country’s rural west. In many ways the future of e-commerce has already arrived in China, and yet there is still much more scope for its development as a result of large-scale, diversified investments being made by China’s tech titans. Advancements in e-commerce not only yield benefits for Chinese consumers, they also help address important areas such as infrastructure development, product safety concerns and cross-border global trade. Ultimately, China e-commerce is much more than simply a means for consumers to secure bargains on everyday purchases. It is an important driver of economic and social development that is powering transformational change across the country.